On this episode of 'Homeless in San Diego: Real People, Real Stories,' host Greg Anglea, CEO of Interfaith Community Services, welcomes Sarah Gomez. Sarah is a Marine Corps veteran, mother of two, and graduate student at Cal State San Marcos. Today she is also an Instructional Technician and Academic Coach at the university. Greg and Sarah discuss her journey from a successful homeowner to losing everything and becoming homeless with her two children and nowhere to go after her husband was sentenced to jail. Listen to learn how Sarah’s resilience and grit, and her commitment to her children led her to where she is today. “If it wasn’t for Interfaith, then I would be one of those families on the street corner,” said Sarah, “Give to programs like Interfaith… Its why we’re here today.” Click here to donate. Advocate to your elected officials to prioritize government grants to end and prevent homelessness for moms like Sarah - more resources for homelessness prevention are especially needed. Interfaith has a special fund, “Offering Hope in Housing,” which is used to help those families facing imminent eviction. Click here, and select “Offering Hope in Housing” from the dropdown menu to donate to this fund and help mom’s like Sarah. On this episode of ‘Homeless in San Diego: Real People, Real Stories,’ host Greg Anglea, CEO of Interfaith Community Services, is joined by CEO of Veterans Village of San Diego (VVSD), Kim Mitchell, and army veteran Rod Gabriel. “Every veteran has raised their right hand, has committed an oath to serve and do something beyond themselves; yet, veterans are disproportionately represented among people experiencing homelessness,” says Greg. Army veteran, Rod, shares his inspirational story about the homelessness he experienced after serving in the military. His journey includes imprisonment, addiction, and homelessness, until he found VVSD, which helped him on his road to recovery and finding his path as a successful entrepreneur. Be proactive in helping homeless veterans. Encourage them to seek services. Have compassionate in outreach toward homeless veterans and do not make hasty assumptions. Support organizations like VVSD and Interfaith financially and by volunteering. Michael Williams, published author and formerly homeless Marine Corp veteran, in the podcast studio! On this episode of 'Homeless in San Diego: Real People, Real Stories,' host Greg Anglea, CEO of Interfaith Community Services, welcomes Michael Williams, a published author and formerly homeless Marine Corps veteran. The two discuss what life was like for Michael before he ended up on the streets - a successful man, who not only was a consultant in the performing arts industry for 10 years, but also has a degree in economics and served his country as a Marine Corp Infantry Officer. But then he got sick. He had to sell his home, goods, and eventually his car just to get by, until he was able to receive help at Interfaith. Michael makes a point to express his gratitude for the donors who support Interfaith, who ultimately made it possible for him to regain his self-sufficiency. For the first 10 people who reach out, Interfaith will do a giveaway of Mr. Williams book! Interfaith owns 80 apartments on 1 block of Escondido. They are used to help stabilize people and support reunified families who find themselves in a similar situation as Brie. Through this, Interfaith was able to provide Brie with 18 months of stability. Brie was able to get clean, address some of the mental health issues she had struggled with, and eventually was approved by the courts to reunite with her daughter. But she needed a great deal of support in order to accomplish all that she has. She utilized what’s known as “Harm reduction therapy” for an illness in a mental health situation where addiction it’s a co-occurring disorder. They work on getting your mental health stabilized and treat you while intoxicated. She couldn’t get clean or off of drugs because she wasn’t finding the right help. Harm reduction does not require sobriety to treat mental health issues. UCSD allowed her to walk into the program without strict expectations, and was accepted with open arms. She felt loved, encouraged, and lifted up until her spirit was strong enough to feel ready to quit. If a list Pay equitable wages for the work that’s being done. Check out the Adopt a Family Program during the holidays. Brie discussed how her family”adopter” gave her a basket of cleaning supplies, laundry detergent, and other home necessities. The family also bought her daughter clothes and a bicycle. She said it felt like heaven to receive so many gifts. If you or someone you know is experiencing substance abuse, check out the Harm Reduction Therapy at UCSD. While some organizations only help people when they stop using drugs, they understand that it is not that easy. They provide a safe place to receive therapy and will listen to people even while they are intoxicated. The program allows you to get strong enough to stop the addiction through their treatment plans. On this episode of ‘Homeless in San Diego: Real People, Real Stories,’ host Greg Anglea, CEO of Interfaith Community Services is joined by Gary Warth of the San Diego Union Tribune. Warth shares his unique perspective about the stories and issues surrounding homelessness. The purpose of their discussion was to share insight into the realities some people face while experiencing homelessness as well as help listeners be more educated and informed about what’s taking place in our communities. One of Warth’s goals as a journalist investigating a story is to understand what homeless people need rather than allowing committee members to make decisions for them. For example, he spoke with a woman in her mid-60s. She has a five page resume and wants to work, but fears not being able to find a job because she cannot access a shower and does not have clean clothes. Another man said he waits in line at 4am to use a public shower with a hundred other people and only half in line may get to use it. Warth also gave insight into the daily lives of several homeless veterans and their success stories. He shared that homeless people are capable of changing their lives in major, incredible ways and shared inspirational stories about their journeys from the streets to stability and how they are now in a place to help others. Another topic Warth and Anglea discussed was the impact that one person can have on another person’s life, especially by their outreach efforts. All it takes is one person to care about someone to motivate great changes. This week’s podcast is a great way to understand the current issues surrounding homelessness within our San Diego community, gain more insights into their daily lives, inspire kindness, and to help listeners become more educated and informed. If a listener has a story that’s worth sharing, reach out to Gary to learn more about available resources. Contact Gary at: gary.warth@sduniontribune.com | Phone: (760) 529-4939. Read what Gary is writing to learn more about the stories he shares that are informative and eye-opening. Get involved in agencies, make donations, and Gary recommends that people stay educated about the work going on in their community. Reach out to Interfaith to see how you can help through donations to help end and prevent homelessness this year. On this episode of ‘Homeless in San Diego: Real People, Real Stories,’ host Greg Anglea, CEO of Interfaith Community Services, is joined by Executive Director Krysta Esquivel and David Baker of YMCA Youth & Family Services (YFS). David shares his personal journey, coming from “a background of dysfunction,” and experiencing homelessness at a young age. “I would say I never really had a home,” said David, until he found YMCA YFS. Krysta discusses the goals of the organization around social responsibility and helping vulnerable youth and families. David is a living example of how the cycle can be broken; not only is he no longer homeless, but he is now an employee at YMCA YFS, helping those who are in the shoes he once was; and he wants all youth experiencing homelessness to know: you are not a lost cause. Understand that there is a fundamental difference between homeless youth and homeless adults, and therefore, we must implement different interventions. Interact with your local policy-makers. Let them know that there are people behind this cause. On this episode of ‘Homeless in San Diego: Real People, Real Stories,’ host Greg Anglea, CEO of Interfaith Community Services, is joined by Tracy, a Navy Veteran and graduate of Interfaith’s Recuperative Care Program located at our Hawthorne Veteran and Family Resource Center. Tracy also introduces Max, his loyal companion and the first service dog to live at the Recuperative Care center (and to come on the podcast! ), as well as his son, Caleb, who is inspired by and proud of his dad’s journey. Tracy with his son, Caleb at his graduation. When Tracy first came to Interfaith, he was living in his car and struggling to treat his PTSD and schizophrenia. When he was offered a way out of homelessness through Recuperative Care, Tracy was skeptical of accepting the help. Tracy shares how grateful he is that he did and how Interfaith truly turned his life around. On this episode of ‘Homeless in San Diego: Real People, Real Stories,’ host Greg Anglea, CEO of Interfaith Community Services, is joined by Reverend Meg Decker, Board Chair at Interfaith and leader of Trinity Episcopal Church in Escondido. 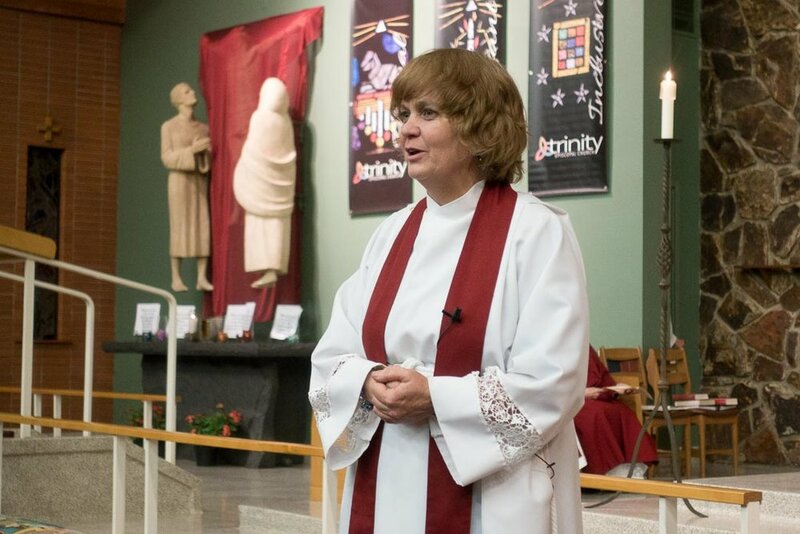 As the ‘boss lady’ Rev. Meg discusses her experiences volunteering at Interfaith’s Haven House Shelter, sharing conversations with residents over their pancakes with sporks, and also speaks to her role as Board Chair, making tough decisions that directly impact those residents. Greg and Meg discuss how our neighbors experiencing homelessness truly have to fight back and the interesting conversation that results shows us that life is meant for more.